What’s the deal on saturated fat? My thoughts: As I keep saying, nutrition science is complicated and this article, by an excellent science journalist, is the latest in a series by excellent science journalists (see, for example, the recent books by Gary Taubes and Michael Pollan) to point out the inconsistencies in data on saturated fat and heart disease risk. Let me make several quick points: (1) All fats–no exceptions–are mixtures of saturated, unsaturated, and polyunsaturated fatty acids (2) Saturated fats occur in greater proportions in animal fats–meat and dairy foods, (3) Some epidemiologic evidence–but not all–suggests that people who eat a lot of meat and dairy foods have a higher risk of heart disease than people who eat a lot of fruit and vegetables (this is correlation, not causation), (4) The same clinical studies that show how trans fats do bad things to blood cholesterol levels also show that saturated fat does too, although not as much (But: people take in a lot more saturated fat than trans fat), and (5) Saturated fat is a single nutrient and the studies reviewed and discussed by the journalists take saturated fat out of its dietary context. Out-of-context studies of single nutrients are exceedingly difficult to interpret. At the moment, today’s dietary (not single nutrient) advice is the same as it has been for the last fifty years. As I put it in What to Eat, “Eat less, move more, eat plenty of fruits and vegetables, and don’t eat too much junk food.” Michael Pollan gives exactly the same advice: “Eat food. Not too much. Mostly plants.” Do this, and you really don’t need to give a thought to single nutrients. 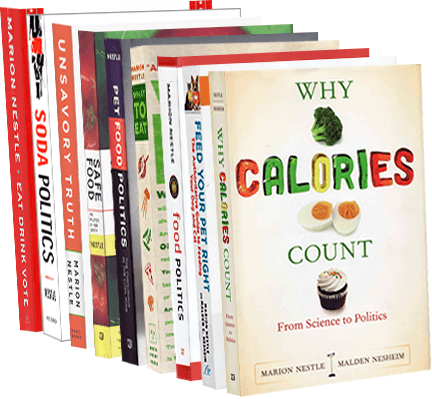 I discuss the politics of diet and disease recommendations in my book, Food Politics (now out in a new, expanded edition), and this particular question in “Ask Marion” on Eating Liberally. Does this help at all? Thanks for asking.